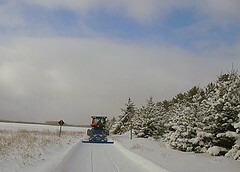 Photo taken 12/5/07 Groomer Dan Clementz on the South TASA trail, making a swath so the guys could get in with a 4 WD truck to finish a few signs. The snow was so deep, even after going through with the groomer, that the 4WD truck got stuck. Luckily they had a strap and Groomer Dan could pull the truck out. It ended up with all 3 guys in the groomer to get to the area to sign (instead of trying the truck again!). Thanks to Buzz Medalis (one of TASA’s groomers) for the photo!